Services | Distribution Solutions, Inc. Whether it's across town or across America, DSI leads the area with a portfolio of offerings. No matter the size, weight, or delicate nature of your freight, DSI has a transportation solution for you and your business. DSI offers complete brokerage services through our Dispatch Services Group. We want you to be able to get the best transportation options in the shortest amount of time. And since we are also freight carriers, we understand the requirements and the logistics required to get your products to their next destination on time and in the condition they were put on the truck. 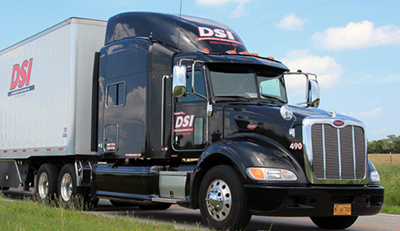 Let DSI give you the solutions you want for all of your transportation needs. Our full truckload service is best when you have enough cargo to fill an entire truck. Full truckloads can also be used if you wish to have your cargo on a designated truck due to the product’s high risk and/or delicate nature. Full truckload shipments stay on the truck the entire time and can be tracked using our McLeod LoadMaster Trucking Management Software. When you don’t have a lot of freight, there is a more budget friendly way of transporting your goods. Many businesses, especially small businesses, utilize our LTL services in order to save money on transportation costs by sharing a truck with other companies along their route. Let our experienced logistics experts get your freight delivered while saving you money when you only pay for the space you use. Dry van carriers are perhaps one of the most requested types of freight transportation used in the industry. Although the temperature in dry vans is not regulated or controlled, these boxes on wheels are versatile, keep your inventory from being rained on, and keep it safe from prying eyes. From full truck loads to LTL’s, DSI’s dry vans have the capability to go get your shipment from point A to point B. Temperature controlled and/or refrigerated freight transport is the way to go when you have temperature sensitive cargo. With DSI’s temperature controlled and refrigerated trucks, you can be confident that your products will be monitored and regulated throughout the entire trip. We understand the time sensitive nature and strict guidelines surrounding perishable and temperature controlled items. From perishable food to pharmaceuticals, DSI has the ability to get your cargo where it needs to be while keeping it safe, on time, and temperature regulated. From pre-planning to the overall execution and logistics, DSI has what it takes to get your freight from one end of the country to the the other end. We know that there is a variety of cargo that is carried long distances, therefore we take extra precautions to make sure that the type of truck needed is matched to the type of freight being carried in order to provide the best transport solution available. Due to our experience, our professionally seasoned drivers, our efficiency methods, and attention to detail, Distribution Services, Inc. is the top choice when deciding on your next long haul trucking service provider. For smaller or more delicate single items, DSI also offers local and regional shuttle services. With a wide variety of services, you only need one company to help you with your cargo transportation. With competitive pricing, professional drivers, experienced dispatchers, and so much more, you can rest easy when you choose Distribution Services, Inc. as your one stop transportation shop. To inquire more about all of our offerings and services, contact Distribution Services, Inc. today!